BOCA RATON, FL--(Marketwired - June 23, 2015) - Earth Science Tech, Inc. (OTCQB: ETST) ("ETST" or "the Company"), a unique biotechnology company focused on nutraceuticals, bioceuticals and dietary supplements, announced today that DV Biologics, a leading biological company, has confirmed ETST High Grade Hemp CBD (Cannabidiol) Oil decreased oxidative stress in human brain cells in vitro. The scientific study which was done independently by DV Biologics, a company that provides biological tools and research for the advancement of medicine, illustrates that using ETST High Grade Hemp CBD (Cannabidiol) Oil can rescue the detrimental effects of hydrogen peroxide on human brain cells (see study below). Interestingly, all the varying concentrations of ETST High Grade Hemp CBD (Cannabidiol) Oil used in this study worked similarly to rescue the detrimental effects of hydrogen peroxide on human brain cells. This data suggest that ETST High Grade Hemp CBD (Cannabidiol) Oil may have neuroprotective properties. This is the first part of the independent scientific studies that will be completed DV Biologics in order to demonstrate that ETST is focused on providing the best quality and most pure High Grade Hemp CBD (Cannabidiol) Oil. The goal of these studies is to test if ETST High Grade Hemp CBD (Cannabidiol) Oil can assist as a neuroprotectant which may help with neurodegenerative disorders. "Keeping the public informed on the progression of studies being done on ETST High Grade Hemp CBD (Cannabidiol) Oil and products is of utmost importance to us and of course to you, the public," stated Matthew Cohen, CEO of ETST. "We were informed by DV Biologics that a portion of the studies looking at the role of ETST High Grade Hemp CBD (Cannabidiol) Oil in free radical and oxidative stress formation on brain cells was completed. We decided to release this part of the data prior to completing the remainder of the studies as this data is exciting and very encouraging for us and the users of our ETST High Grade Hemp CBD (Cannabidiol) Oil. We will continue to keep the market and consumers worldwide updated and we will continue to focus on demonstrating that ETST is dedicated to providing products with scientific backing. We hope that ETST High Grade Hemp CBD (Cannabidiol) Oil may be beneficial as a dietary supplement to consumers with neurodegenerative disorders." Dr. Gonzalez, Vice President of Research & Development for DV Biologics states, "the data is encouraging and clearly demonstrates that ETST High Grade Hemp CBD (Cannabidiol) Oil reduces lipid peroxidation in human brain cells. There are other pathways in free radical formation and oxidative stress that occurs in the brain in disorders such as Alzheimer's but lipid peroxidation is one of the key damagers of brain cells. By the request of ETST, we are looking at other pathways to support the data presented below. We should have the studies completed by mid-third quarter." The cells used by DV Biologics in these ETST studies are of human origin and are cells that have not been genetically modified. They are called primary cells which provide alternatives to using animal cells and performing animal studies which may not translate well into the human condition. These cells allow for the specific targeted studies such as those described below which will focus on reducing free radical formation and oxidative stress in the brain. Does Earth Science Tech (ETST) High Grade Hemp CBD (Cannabidiol) Oil have a Neuroprotective Effect? The DV Biologics Report and data below is encouraging and clearly demonstrates that ETST High Grade Hemp CBD (Cannabidiol) Oil reduces lipid peroxidation in human brain cells. The Brain: When fat (lipids) from food is digested, it is later broken down into fatty acid molecules. The brain then uses these for raw materials to assemble the special types of lipids it incorporates into its cell membranes. Two-thirds of the brain is composed of lipids. The vast majority of the different cell types in the brain require lipids for correct transmission of signals, providing energy and structural support to our cell membranes. Lipid Peroxidation: Cells in the body and particularly in the brain are under constant attack by free radicals and oxidative stress. There are protective mechanisms that help deter this normal damage that occurs; however, with aging the protective mechanism declines substantially and degeneration of the brain occurs. Lipid peroxidation is the degradation of lipids that occurs as a result of oxidative damage and is a useful marker for oxidative stress. 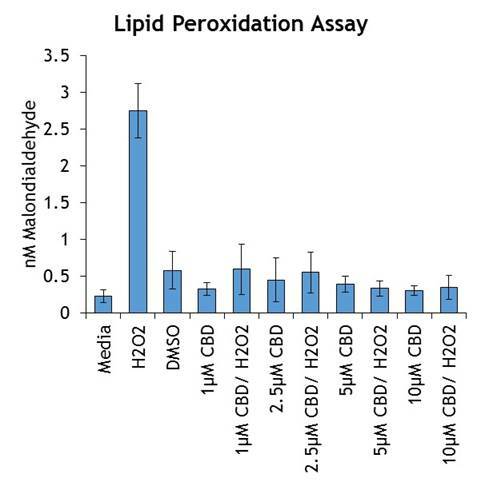 Lipids are susceptible to an oxidative attack, typically by reactive oxygen species, resulting in a well-defined chain reaction with the production of end products such as malondialdehyde (MDA). In this experiment, lipid peroxidation is determined by the reaction of MDA with thiobarbituric acid (TBA) to form a fluorometric complex, proportional to the amount of MDA present, after induction of peroxidation with hydrogen peroxide. Two 24-well plates were coated with Matrigel for 1 hour at 27° Celsius. The plates were seeded with human neural cells at a density of 2 X 104 cells/cm2. The cells were grown in neural media supplemented with 20 ng/ml of epidermal growth factor (EGF) and basic fibroblast growth factor (bFGF). Media was changed every 2-3 days. CBD oil/Neural-Growth media was prepared by diluting the CBD oil in dimethyl sulfoxide (DMSO). The suspension was filtered with a 0.22 micron filter. The CBD suspension was then diluted in N-GRO media to contain the following concentrations of CBD: 10 µM, 5 µM, 2.5 µM, and 1 µM CBD. After the cells reached 80-90% confluency, base media was replaced with media containing CBD or control media; the controls were media only, media with DMSO 1:100, and media with hydrogen peroxide (H2O2) (H2O2 was added during induction phase). The cells were incubated under experimental conditions for 48 hours in media containing CBD. The cells were incubated with H2O2for 120 minutes at 37° Celsius. Media was aspirated and the cells were lysed. Total protein was precipitated, and reaction to form MDA-TBA adduct was performed. The reactions were placed in a 96-well plate. MDA fluorometric detection was done by measuring fluorescence intensity (excitation 532 nm/ emission 553 nm) of samples and standard curve. 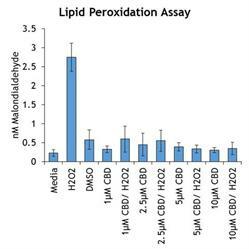 Relative lipid peroxidation was measured by subtracting blank value from all readings. Figure legend: Earth Science Technology (ETST) High Grade Hemp CBD (Cannabidiol) Oil is protective against lipid peroxidation in human brain cells in vitro. Human brain cells were incubated with media (control), hydrogen peroxide (H2O2) to cause oxidative stress, DMSO which is the solvent to dilute CBD in media and different concentrations of CBD with and without H2O2. Error bar = Standard deviation. When brain cells are incubated with H2O2 by itself lipid peroxidation occurs substantially as seen in the graph above. Lipid peroxidation as measured my MDA present is seen to reach greater than 2.5 nM as compared to controls of media and DMSO alone which register 0.5 nM or less. When human brain cells are treated with ETST High Grade Hemp CBD (Cannabidiol) Oil in concentrations varying from 1 µM to 10 µM prior to the addition of H2O2 (prophylactically), human brain cells are protected against the damaging effects of lipid peroxidation. Lipid peroxidation is damaging to human brain cells. ETST High Grade Hemp CBD (Cannabidiol) Oil in varying concentrations rescues the damaging effects of lipid peroxidation to human brain cells. The data suggest that ETST High Grade Hemp CBD (Cannabidiol) Oil may serve as a neuroprotectant to brain cells. Further studies on other oxidative stress and free radical pathways are needed in order to support and extend this data. ETST invites all interested parties to contact the company at info@earthsciencetech.com in regards to securing its "High Grade Hemp CBD (Cannabidiol) Oil" in bulk for wholesale, resale, private labeling or distribution. CBD (Cannabidiol) is a natural constituent of hemp oil and legal to consume, sell and possess in the U.S.A. and over 40 countries as dietary supplement. From product formulating, mixing, labeling and launching ETST can do it all. ETST is always open to forming new strategic partnerships, joint ventures and/or supplying vendors, resellers and third party distribution companies with its High Grade Hemp CBD (Cannabidiol) Oil/Products at wholesale prices in order to better help supply consumers as well as the health and wellness markets on a large scale. Furthermore, ETST "Ultra-High Grade Hemp CBD Oil" is the newest scientific breakthrough, all natural and organic nutraceutical product for E-Liquids (E-Juices). For those consumers, vape stores, e-cig stores and distributors looking for the world's best CBD (Cannabidiol) Rich Hemp Oil to mix and formulate a leading E-Liquid (E-Juice) product, the ETST "Ultra-High Grade CBD Rich Hemp Oil" is it. If you're interested in securing this new cutting edge product or have questions please contact us today at info@earthsciencetech.com. You can view, research and purchase small quantities or bottles of ETST High Grade CBD (Cannabidiol) Rich Hemp Oil at www.earthsciencetech.com/cbd-rich-hemp-oil. Humans are designed with a built-in Endocannabinoid System (ECS). Research shows that many scientists believe cannabinoids work synergistically to support the whole human endo-cannabinoid system (internal and natural human cannabinoid system). It is your body's way of communicating with itself and properly regulating the way every other body system functions from your brain to your toes. The Endocannabinoid System (ECS) has shown to control pain sensation, appetite, temperature regulation, stress reactivity, immune function, and sleep as well as other processes. Even more interesting is that muscle and fat tissue also utilize these receptors to control their processes. Consumers should think of the Endocannabinoid System as one of the body's main control and command centers for tweaking your metabolism's ability to react and adapt to the world around it. Like many other nutrients in our diet, Cannabinoids can become exhausted and in need of steady dietary replenishment. Scientific studies and data show that Hemp CBD (Cannabidiol) Oil as well as all micronutrients (phytonutrients) and phyto-cannabinoids found in the oil work in harmony with the human body's own endocannabinoid system making a positive effect for overall wellness. Hemp oil contains CBD -- a non-psychoactive compound of the plant. There are millions of hemp oil consumers around the world and this number is rapidly rising with an increasing number of reports and studies showing a variety of benefits of hemp oil. ETST High Grade Hemp CBD (Cannabidiol) Oil: ETST High Grade Hemp CBD (Cannabidiol) Oil is all-natural, organic and formulated using a wide array of cutting-edge technologies. ETST is capable of supplying and offering its High Grade Hemp CBD (Cannabidiol) Oil in all 50 states and over 40 countries as a nutritional and dietary supplement designed to support overall wellness. ETST's High Grade Hemp CBD Oil is all-natural and derived completely from the federally legal industrial hemp plant. Industrial Hemp (Hemp) is not marijuana and will not get you 'high' and it does not require a medical license of any kind to authorize purchase. It is lab tested multiple times during the manufacturing process, from seed to shelf. This also includes being tested for CBD content, other Cannabinoid content, yeast/mold/fungus, and bacteria like E. coli to ensure safety and top quality. Cannabidiol (CBD) is a naturally occurring constituent of hemp oil. ETST believes that Hemp CBD Oil awareness today is where Omega 3 and Omega 6 fatty acids were 15 to 20 years ago. ETST goal is to help consumers Worldwide with their overall wellness through advanced formulations with its High Grade Hemp CBD (Cannabidiol) Oil and other cutting edge nutraceuticals and dietary supplements. Hemp CBD Oil is posed to be the most renowned and effective natural compound and botanical alternative introduced to the nutritional and dietary supplement industry in decades. Consumers worldwide desperately need more effective safe botanical alternatives to help them with their overall health and internal wellness. Modern science has identified over 400 phytonutrients in various parts of the industrial hemp plant. These include hundreds of Terpenoids, Essential Oils and Antioxidants but perhaps the most dynamic are a group of 80 compounds called Cannabinoids that are exclusively found in Hemp and one other place; our bodies. There are roughly 80 different phyto-cannabinoids, most prominently CBD, CBC, CBG, CBN, and most likely others yet to be effectively identified. In addition to the cannabinoids present in High Grade Hemp CBD (Cannabidiol) Oil extracts, there are also many other types of natural molecules such as amino acids, fatty acids, flavonoids, ketones, nitrogenous compounds, alkanes, alcohols, glycosides, pigments and terpenes among other things. The most common terpenes in our Hemp CBD oils are Beta-caryophyllene, Caryophyllene Oxide, Myrcene, Terpinolene, α Bisabolol, α Pinene, Nerolidol, Ocimene and Phytol. ABOUT ETST (www.earthsciencetech.com): ETST is a unique Biotechnology company focused on delivering cutting edge Nutraceuticals, Bioceuticals and Dietary Supplements designed for excellence in the areas of Health, Wellness, Sports and Alternative Medicine and to improving the quality of life for Consumers Worldwide. ETST is also dedicated to providing Natural Alternatives to prescription medications through the use of its cutting edge Nutritional and Dietary Supplements. This may include products such as its High Grade Hemp CBD (Cannabidiol) Oil, Vitamins, Minerals, Herbs, Botanicals, Personal Care Products, Homeopathies, Functional Foods and other products. These products may be in various formulations and delivery systems including (but not limited to) capsules, tablets, soft gels, chewables, liquids, creams, sprays, powders, and whole herbs. ETST is focused on researching and developing innovative Hemp extracts and to make them accessible Worldwide. ETST plans to be the premier supplier of the highest quality and purity of High Grade Hemp CBD (Cannabidiol) Oil. ETST's primary goal is to advance different High Quality Hemp extracts with a broad profile of Cannabinoids and additional natural molecules found in Industrial Hemp and to identify their distinct properties. The company is dedicated in offering its consumers the finest and purest quality All Natural-Organic Hemp CBD Oil while never compromising on quality. ETST High Grade Hemp CBD (Cannabidiol) Oil is classified as "food based" and therefore perfectly permissible in all 50 states and more than 40 countries. Cannabinoids (Cannabidiol/CBD) are natural constituents of the Hemp plant and CBD is derived from Hemp stalk and seed. Hemp oil is a well-known dietary supplement and the naturally occurring CBD possesses no psychoactive qualities and presents a continuing stream of overwhelming evidence of significant Wellness benefits. With no psychoactive ingredient, Hemp CBD Oil is a ready-for-market Hemp-based Nutraceutical. The United States Food and Drug Administration (FDA) currently considers non-THC hemp based cannabinoids, including CBD, to be "food based" and therefore saleable. These new non-psychoactive CBD-rich hemp oil products that ETST has geared up to market and distribute are beyond reproach. CBD (cannabidiol), a naturally occurring constituent of the Industrial Hemp plant, promotes and supports the nutritional health of aging bodies in particular. Source: US Government Patent #6,630,507 "Cannabinoids as antioxidants and neuroprotectants." ETST does not grow, sell or distribute any substances that violate United States Law or the controlled substance act. ETST does sell and distribute hemp based products. ABOUT DV BIOLOGICS, LLC (www.dvbiologics.com): DV Biologics is a global supplier of human biological tools to academic institutions and pharmaceutical companies engaging in cell and drug based discovery and development. Our mission is to provide biological tools needed to advance the innovation of technology that will ultimately be used to treat or prevent multiple human degenerative disorders and diseases. DV Biologics offers a diverse range of novel human biological tools and services that can be used to study various human pathological conditions in addition to an expanded product portfolio of unique cell types and tissue-derived products.